Life After The Affordable Care Act: What’s Next? Do You Know What Your Doctor Does? The New American Healthcare Act: Will It Bring Down Costs? Dr Elaina George is a Board Certified Otolaryngologist. Her interest in the politics of healthcare and the reform effort have led her to become both a powerful voice for the practicing physician, an advocate for the patient, and a healthcare policy analyst specializing in healthcare consumer driven solutions. She graduated from Princeton University with a degree in Biology. She received her Masters degree in Medical Microbiology from Long Island University, and received her medical degree from Mount Sinai School of Medicine in New York. Dr George completed her residency at Manhattan, Eye Ear & Throat Hospital. Her training included general surgery at Lenox Hill Hospital, pediatric ENT at The NY-Presbyterian Hospital, and head and neck oncology at Memorial Sloan-Kettering Cancer Center. She has published in several scientific journals and presented her research at national meetings. 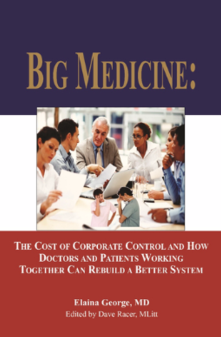 As a solo practitioner in private practice who is also a small business owner, she has a unique perspective on the problems of health care delivery, the true costs of healthcare and viable solutions. Dr George is a recipient of the Patients’ Choice Award in 2008 and 2009. She was honored with membership in The Leading Physicians of the World and Who’s Who Top Doctors Honors Edition. For media requests contact 404-840-0415 or email dynomuse@aol.com. Host of Medicine on Call, Americas web radio 2/2009 – Present; Liberty Express Radio 9/2013-2015; Cowboy Logic Radio 9/2014-2016; Liberty Talk.fm Radio 2016-Present: A weekly talk show airing nationally that explores the politics of healthcare and discusses medical issues that empower patients to understand and take control of their health. Radio Interview on www.newmediajournal.us – The healthcare reform bill (HR 3962) Will it have an adverse effect on patient care? Listen to Dr. George on her program Medicine on Call on Libertytalk.fm on Sat-Sun at 12 noon. The program will highlight healthcare policy, the politics of healthcare, the power of the doctor and patient relationship, and solutions that will help the patient to become a savvy healthcare consumer. It is the place where healthcare, business and current events connect. Subscribe to the Medicine on Call podcast at iTunes!